Just days before New York’s fall art auctions, a painting by a famous name is up for grabs. But this work, a mural that stretches 12 feet high and 22 feet long, is free to whoever can extract it from the East Village loft where it was created. The artist, Barney Rosset, was a Greenwich Village fixture better known as a publisher and provocateur than a painter. Mr. Rosset, who died in February 2012 at age 89, flouted convention, rewrote censorship laws and championed writers such as Samuel Beckett, D.H. Lawrence and Henry Miller at his publishing house, Grove Press. “He was a person who didn’t sleep much and didn’t eat much. I don’t know where he got the energy” to paint, said his widow, Astrid Myers Rosset. A few years before his death, Mr. Rosset took a paintbrush to their living-room wall and, with characteristic zeal, poured himself into chronicling his picaresque life in a swath of primary colors dotted with dioramas the size of jewel boxes. Over 25 years together, Ms. Rosset became accustomed to her husband’s terrier-like attachment to quixotic ventures. After they met, he was constantly planting—and then digging up and moving—truckloads of trees and shrubs around her house in East Hampton. When they were living together in the East Village, he couldn’t keep from rearranging the loft’s furniture, including a well-worn pool table. And after they married—her second and his fifth—his final obsession became an autobiography in acrylic paint. Mr. Rosset worked feverishly on the mural, using a stepladder to paint sections near the ceiling. When he no longer felt safe climbing the ladder, he reached high-up spots by wielding a paintbrush taped to a pool cue or cane. Times also are changing. Ms. Rosset, who is 83, plans to leave the city and live full-time in her East Hampton home. The Fourth Avenue building where she and Mr. Rosset once rented not one floor but two, back when his publishing ventures were thriving, is for sale. 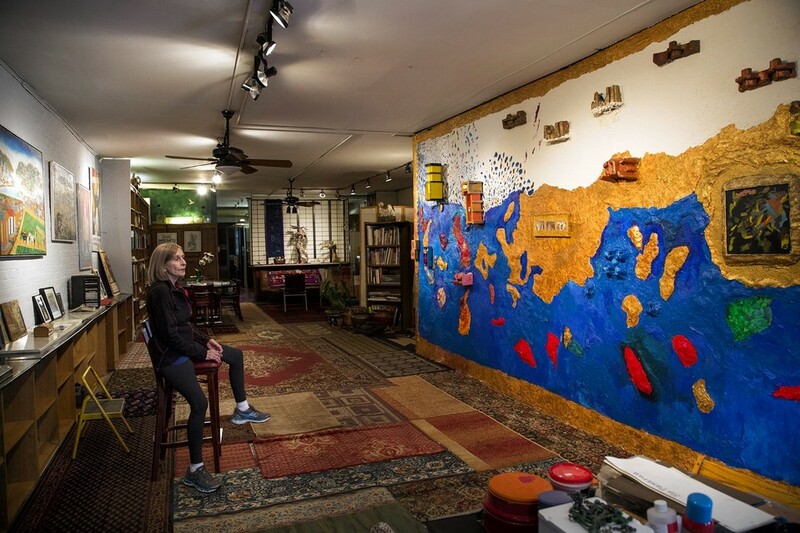 Moving the mural to East Hampton isn’t an option, Ms. Rosset said—her house there is smaller than the East Village loft. Mr. Rosset wasn’t a totally untutored artist. His first wife, Joan Mitchell, who encouraged him to revitalize Grove Press after serving in World War II, was a leading Abstract Expressionist. The painting appears to portray different phases of Mr. Rosset’s life. A diorama with toy soldiers reflects his wartime service. In another diorama, skeletons play pool, harking back to epic games at the table in the loft. The notion that the mural’s days may be numbered has kindled interest but no takers. A documentary, titled “Barney’s Wall,” is in the works by Sandy Gotham Meehan, a devotee of Grove Press’s work, and others. In recent weeks, film shoots for “Barney’s Wall” have unfolded like an extended memorial service. With Ms. Rosset watching, artists and writers stroll before the mural, reminiscing about her husband and offering their take on his creation. Occasionally Ms. Rosset volunteers specifics, such as dates, to help jog memories.